In order to keep pace with never ending demands of the customers, our company is instrumental in offering tug boat. TUG Boat design and boats available against order. is a boat, with a high-powered engine, used to manoeuvre, primarily by towing or pushing, other vessels in harbors, over the open sea or through rivers and canals. They are also used to tow barges, disabled ships, or other equipment like towboats. This is a 28m Pusher Tug. 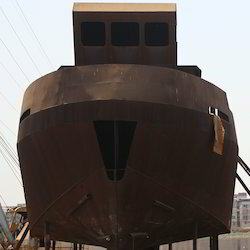 The hull of the tug was fabricated in 20 modules at Master Shipyard, Cochin and shipped to Port Sudan by sea. These modules were then transported to Kosti, Sudan by road (1300 Kms from Port Sudan). A yard was set up in the desert on the banks of White Nile River at Kosti and the modules were assembled. a tugboat, or tug, is a boat used to maneuver, primarily by towing or pushing, other vessels in harbours, over the open sea or through river and canals. Tugboats are also used to tow barges, diabled ships, or other equipment like towboats. Length: 12mt/14mt, beam: 4. 2mt draft: 1. 8mt, displacement: 18m. Tons/24m. Tons (fully loaded) construction: carvel-planked wooden hull with copper, brass and ss fasterings; 3"x3" sawn frames; cabin structure: marine plywood over wooden frames. 2 layers of frp up to deck fender height, optional. the lakshadweep boats are installed with 2x110hp marine diesels.